It was a hot August Sunday. We rolled up the windows even though the air conditioner wasn’t working. We locked the doors. The car was acting up, and had been doing so for miles. I pulled into a gas station in the center of the Harley-filled town. It was closed. The Rover started smoking and quit. There we sat, wondering what to do. One of the biggest and ugliest of the Harley guys parked all around us walked to my window and knocked with one big knuckle. I rolled the window down a couple of inches. “Your wagon’s smoking,” the guy said, pointing at the small cloud forming over the white hood of my Rover. “Yeah,” I said, before asking him about the possibility of finding an auto repair shop. He walked out in front of the smoke cloud. I looked at my wife. What could we do? I popped the hood. The man, and some of his buddies, disappeared under the hood. A few minutes later the big rider reappeared. “You’ve blown a head gasket,” said. My shoulders slumped. I not only knew the Rover wasn’t going ten feet without a new head gasket, a big mechanical operation, I also had about two hundred bucks on me…way short of being able to pay anyone to fix it. The man looked at me over the top of his big ugly sun glasses. It was like he was reading my mind. “We’ll tear it down and have a look,” he said, before walking away and disappearing under the hood, not waiting for an answer. “We’re pretty much screwed,” I breathed over to my wife. Her face had gone white and the kids in the back seat were dead silent. Noises began to come out from under the hood. I had to take a look. I told my wife to lock the doors behind me, and then got out. I moved to the front of the right fender. Four guys worked away at taking things apart. they made believe they didn’t know me. I watched them work at destroying what was left of my car, fascinated by surgical-looking tools with the name “Snap-on” etched into their surfaces in red.After twenty minutes the big man who’d first talked to me looked up. “Your right head gasket’s blown, like I thought,” he reported, wiping his hands on a paper towel a beautiful woman in leather brought to him from behind his back. I tried not to stare at her. The big man smiled, but said nothing. “You want us to fix it?” he asked. I felt a stirring of hope, wondering if my super expensive Range Rover really had an old design Olds engine in it. He pointed at a man eating a hot dog from a nearby charcoal broiler set up in the gas station lot. The big man whistled one of those two-finger whistles and the hot dog guy walked over. I didn’t hear the conversation between the big biker and the parts guy, but in only a few seconds the parts guy was gone on his Harley. The big man told me get my family out and have a hot dog. I knocked on the glass and argued my case to my wife. They got out. We spent the next two hours having hot dogs, drinking beer and talking to some of the most interesting men I’d met in a long time. The big biker finally came over and said it was done, and asked for the keys. I tossed them to him. He went over and started the Rover. It hit on the first go and then proceeded to hum like it never had. The big guys friends all laughed. We stayed for another half hour, before heading out toward Madison. If you think you know Harley riders and you’ve got a pre-disposed idea that they are not nice….well forget it. They would not take my money. Fred Worth, the big guy’s name. Still remember it. Worth a fortune. I always stop for Harley riders if they look like they might need help. I bought a Sportster but have never ridden it. I like the look, the feel, and I can sit on it and make believe I’m really one of the real deal guys. 59 years riding Harley’s, don’t know how many tire’s, radiator hoses, wheel bearings, fan belts,and other thing like that I have done for someone alongside the road. Always sort of figured maybe thy would pass it along, maybe thy do maybe thy don’t. Doesn’t matter I feel I did my part to make thing better. Over 50 years ago I wish someone had stopped for me Pushed my Harley over 80 miles, So I stop knowing what it feels like to be stranded. Not everybody has roadside assistance or even a cell phone. True. About pushing the cycle. Never have that happen in front of me again. Jim like your story, my brother rides a HD and has also helped and been helped when out on the road. There is still a lot of good people out there. but then there are aways downsides to everything we do out here. A great story about folks we sometimes judge the wrong way. I am forwarding this to my Pastor since he is an Army veteran paratrooper and avid Harley rider. Thank you for these great stories. I bought your first 10 days and left a 5 star review on Amazon. Thank you sir for sharing your talents. made the process more fun. That and Salinas, Kansas as a 4th of July weird upside down Viet Vet thing! Depends on your perspective. My brother’s truck was stolen and stripped. We needed a tire and rim on a Sunday. Took off down a two lane just on speculation. No salvage yards open as expected but eventually we came to a big brick house. Grass was tall but not totally abandoned tall. Maybe six weeks uncut. There on the side was a Ford truck with rims that would fit. As we pulled in the long curved driveway a shop appeared around the back of the house. A couple dozen polished Harleys sitting under a drop shed alongside the shop. “Hot damn, we are in luck a biker clubhouse!” As we eased around back in my truck a young man stuck his head out the back door of the house. No doubt a pledge or rookie guarding the bikes. We told him our story. A tire and rim was laying in the back of the truck. “Take it and bring it back when you are done with it.” We did, was going to drop some coin on the guy for beer money but nobody came out when we returned the tire and rim. As you learned, always good people and bad. 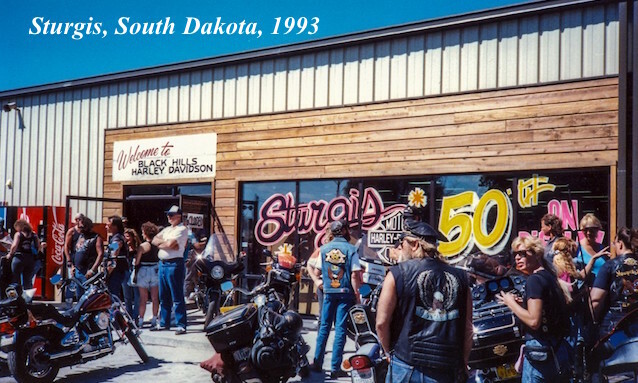 Sturgis is where bikers are on their best behavior anyway. Being moderately large and more than moderately hairy I always made myself at home wherever I went including biker bars. After I retired I worked in Yellowstone National Park for 3 summers. For a couple weeks in August there were several thousand Harley riders who would come thru the park. Met many who were doctors, lawyers, CPA’s, etc. For many this was like going to Summer Camp. My favorite story to tell is that one gal rode in with a 4 year old behind her and a baby in a sidecar. always bothers me. The safety thing about all bikes bothers me however. In spite of the noise, cars are so quiet today and bikes are harder to see. Great short story. Not the first time I’ve heard that story or another version. I was at a “bike night” last night. It was “cereal” night. All the bikers grab a box or two of breakfast cereal and meet up at the Quaker Steak in Largo, FL. Collected about half a semi load of the stuff. Some folks don’t always get a meal, even if it’s just cereal. A lot of them are going to be getting cereal now. Thanks to the Cereal for Kids. Must have been 500 bikers and other customer. That should have been Ah Shau not An Hoa. But I know you’ve heard of that place too. Hell, I got it Joe. You and I obviously know that place, yes. Thanks for your comment and don’t forget to go on Amazon and review the book. I found out that fifty percent of Coke and Pepsi out there goes to tiny babies. It’s the only liquid affordable for their mothers that has energy and sterility. doing this kind of work.